Back in the days of my apprenticeship, one of the first things I was asked to do was draw flash- twenty full pages of it before I would be allowed to pick up a machine. Flash drawing was a totally new skill for me to learn, and to make matters more complicated, my boss asked me to do the first set using ink washes, the black and white cousin of watercolor painting. It was an adventure to say the least, and a great learning experience that helped to prepare me for the steep learning curve of actual tattooing. Drawing and painting flash remains an important skill, not only for apprentices but for any tattoo artist who wants to reach a wider audience than they can personally tattoo, or simply wants to share their own unique style with other artists (and possibly sell a few sets now and then!) So it's great news that Joe Swanson has made a detailed, comprehensive tutorial on painting tattoo flash step-by-step. 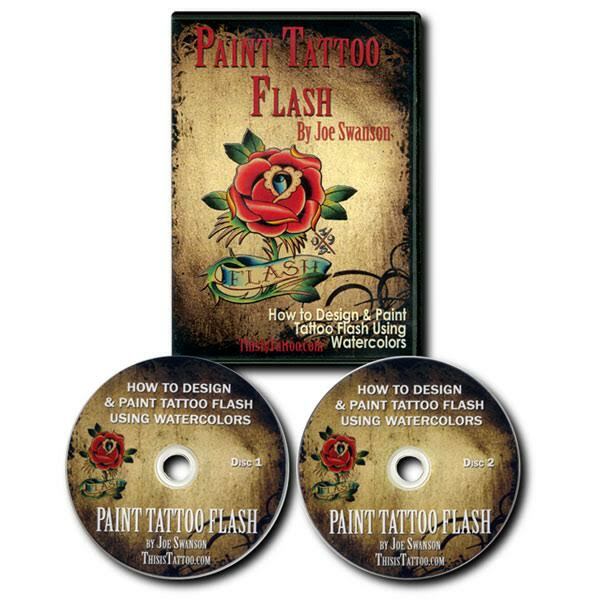 The 2-DVD set, simply called Paint Tattoo Flash, covers every step from selecting the right materials to design transfer, inking, coloring and finishing touches, plus bonus sections on practice exercises and antiquing effects. The set comes with a small booklet that you can keep with you at your drawing table for a quick guide. It's a highly useful and practical tutorial, aimed at getting you functional from a point of starting with zero knowledge but still demonstrating some fairly advanced techniques, all for a very reasonable price. We've got it in stock now at the Tattoo Education online store! While we are talking about watercolors I also wanted to mention Myke Chambers' Watercolor 101 DVD, which overlaps in a few places with the material in the Joe Swanson tutorial but also ventures into all kinds of other interesting places, working with a larger scale design, comparing watercolors with liquid acrylics, different methods of color blending and lining, and taking longevity into account. Both tutorials are highly recommended, and you can save on shipping by ordering them together. 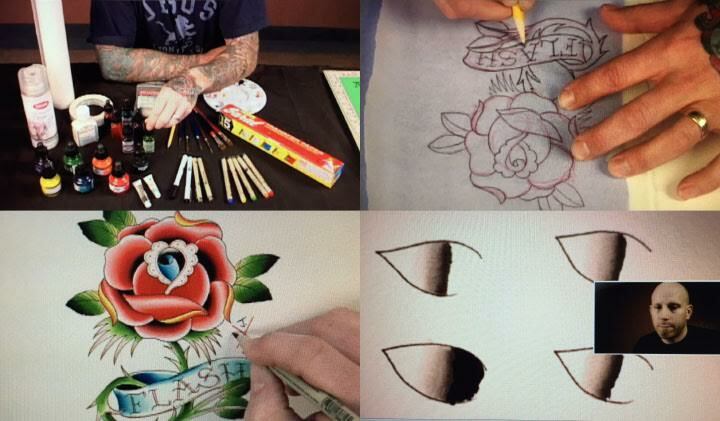 Learn all about watercolor techniques with these two great painting tutorials by experienced working tattoo artists. Drop by the Tattoo Education online store to find out more!